These fast, flavorful turkey burgers are the perfect weeknight meal that the whole family will love. Turkey burgers sometimes have a bad reputation for being dry but you won’t have that problem with my juicy Salsa Turkey Burgers with Avocado Crema. Mixing a cup of your favorite salsa into the meat is a fast and easy way to keep the patties moist and it also adds great flavor. I often add grated onion to my burgers to keep them moist but using store-bought salsa instead is a nice short cut and you can avoid the hassle of using a box grater. This time I used Desert Pepper’s Roasted Tomato Chipotle Corn Salsa which added a nice smoky flavor to the patties. To counteract the savory patties I top the burgers with a cooling avocado crema, which is avocado mashed with a little sour cream, lime juice and cilantro. It’s a great change from traditional ketchup or mayonnaise and it’s so easy, you can make it while the burgers are grilling. The nutrient-rich avocado is naturally creamy and adds healthy monounsaturated fats and fiber as well as folate, potassium and vitamins B6, C, E, and K. Substituting an avocado for mayonnaise is a great smart eating tip. A mashed avocado has a nice silky texture and you’re substituting heart healthy monounsaturated fats for the not-so-healthy saturated fat found in mayonnaise. 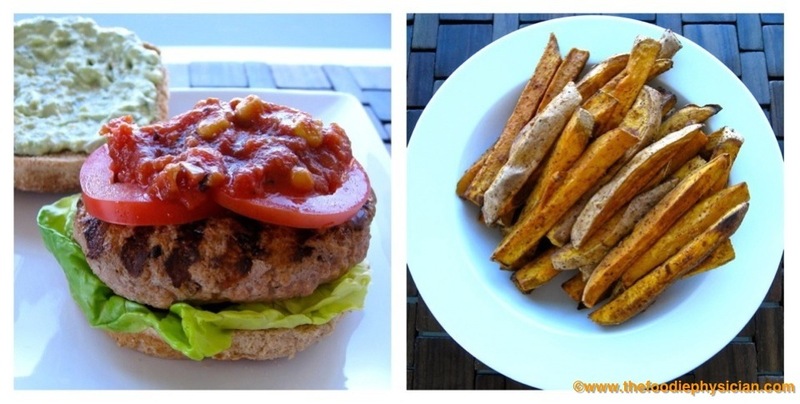 I like to serve these burgers with my Oven Roasted Sweet Potato Wedges. 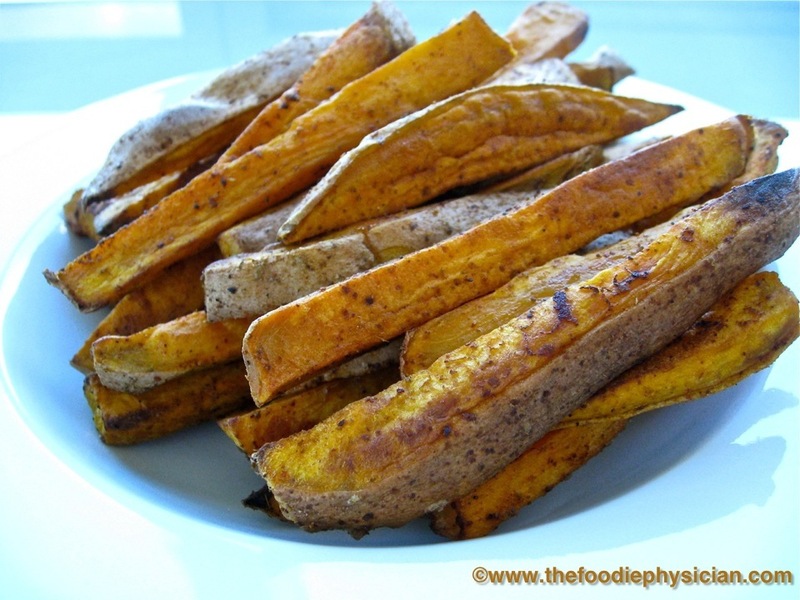 These fries are a yummy and healthy alternative to traditional french fries. Sweet potatoes have about the same amount of carbohydrates as white potatoes but they are full of vitamins, nutrients and antioxidants. And they’re low in calories (a medium sweet potato has about 100 calories), low in sodium and virtually fat and cholesterol-free. Their rich orange color means they’re high in beta-carotene, which gets converted to Vitamin A in the body. One medium sweet potato provides more than 400% of the recommended daily intake for Vitamin A. They are rich in several other nutrients including Vitamins C and B6, manganese and potassium. They also are a good source of fiber, which is important for digestive health and keeps you feeling full longer. I like to dust the fries with some smoky chili powder which nicely complements the natural sweetness of the potatoes but feel free to use any of your favorite spices. Mix the turkey, ½ cup salsa, cumin, ¾ teaspoon salt, ¼ teaspoon black pepper and cayenne pepper together in a large bowl. Form into 4 equal patties, making a slight indentation in the center of each patty so that they cook evenly. If patties are very loose, refrigerate for 10-15 minutes before cooking. Heat a grill pan or large skillet over medium high heat and spray with nonstick cooking spray. Grill the patties about 5 minutes on each side until the meat is cooked through. While the patties are grilling, mash the avocado, sour cream, lime juice and cilantro together in a bowl. Season the mixture with salt and pepper to taste. 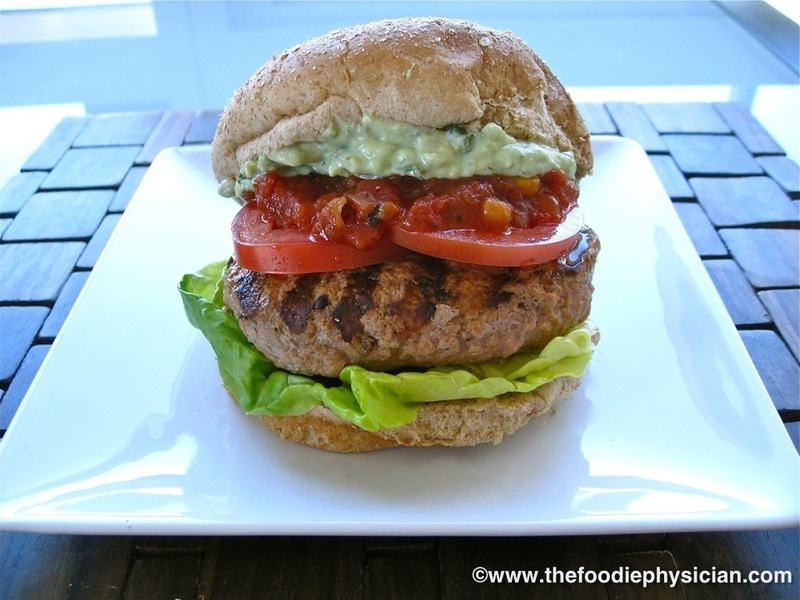 Place a lettuce leaf on each bun bottom then top with a patty and a few slices of tomato. Top with a tablespoon of salsa. Spread some avocado crema on each bun top and close the burgers. Toss the sweet potatoes, oil and spices together in a large bowl. Arrange the sweet potatoes on a baking sheet in a single layer. Bake in the oven for 15 minutes then flip them over and cook another 8-10 minutes until cooked through. Serve warm. I love everything about this meal!! Sounds perfect. What a perfect weeknight meal. My family will love this. Thanks, Lynda- it's definitely a family-friendly meal and it's easy to make. bannock buns with it would be better,but over all good recipe, have to try it! I am ready to try this perfect meal! It has everything I wanted my dinner to have. The avocado crema excites me too. Thanks for sharing! Thanks for your comment! I like to use the avocado crema on a variety of dishes. It makes a great topping for grilled seafood and meat and also works well with tacos and burritos. I'm excited about making the burgers! Avocado crema sounds so cool, I love avocados! I made the sweet potato fries for dinner tonight, yum!! Thank you. So glad you liked the fries! Let me know how it goes if you try the burgers.